It’s been a busy period for my C4S as after five months of ownership, I’ve finally needed to spend out on something other than fuel for it. I’ve previously mentioned the car needed new brakes and tyres all round, and they’ve now been replenished after a trip to Porsche Centre Bournemouth. For the brakes I was happy to stick with an OEM-spec setup as in my view if those Big Reds are good enough for a 996 Turbo they’re good enough for a 996 C4S. I bought the brake discs and pads separately from Heritage Parts Centre last month, which arrived promptly and had been sitting at my house waiting for a gap in my diary to take the car to Porsche. That day arrived in early September and I whisked the car over to OPC Bournemouth where it’d be under the stewardship of one Scott Gardner, whom you’ll recognize in the pictures as our very own ‘ask the expert’ from the front of the magazine. Scott had the discs, pads, wear sensors and anti squeal shims (I had to buy the latter separately) swapped over in three hours without a hitch – you do always assume with a 996 that there is going to be a hitch, be it something as simple as a sheared bolt or ripped thread, which can delay even the most simplest of tasks. Heritage Parts Centre are new to the Porsche industry but I was very pleased with the quality of the brakes, which all married up absolutely fine into my calipers and onto my hubs. Again it sounds obvious but I’ve had wrong parts turn up from other suppliers in the past and this only leads to a frustrating scenario when work has to be stopped because the part doesn’t quite match up. This wasn’t the case here though, and Heritage Parts Centre come highly recommended from me. The brakes will take a bit of time to bed in but already I’m noticing much sharper response to brake pedal applications, which has already inspired me to push the car a little harder. I also addressed the worn rear Continental tyres by replacing them with a set of Michelin Pilot Sport tyres all round. N4 rated (a higher ‘N’ rating means more recent tyre technology has been used), I was recommended them by a Michelin representative when I told him the car is used for shopping runs, plenty of fast road driving and the occasional track day. I’ve never actually ran Michelin tyres on any of my own cars before but have always enjoyed them on other 911s (Pilot Sport Cup 2s are surely the best road tyre ever to grace a 911) and am really looking forward to exploring their limits in the coming weeks. More on their performance will be found in a coming update. It’s standard procedure for Porsche to health check your car while it’s on the ramps, so Scott and I had a good look around underneath the C4S once all the work was done. I was very happy with Scott’s exemplary comments as regards to its overall health and condition – he was shocked when he found out I’m the 11th owner – and his remarks has only further endorsed my decision to purchase this cracking 911 in the first place. 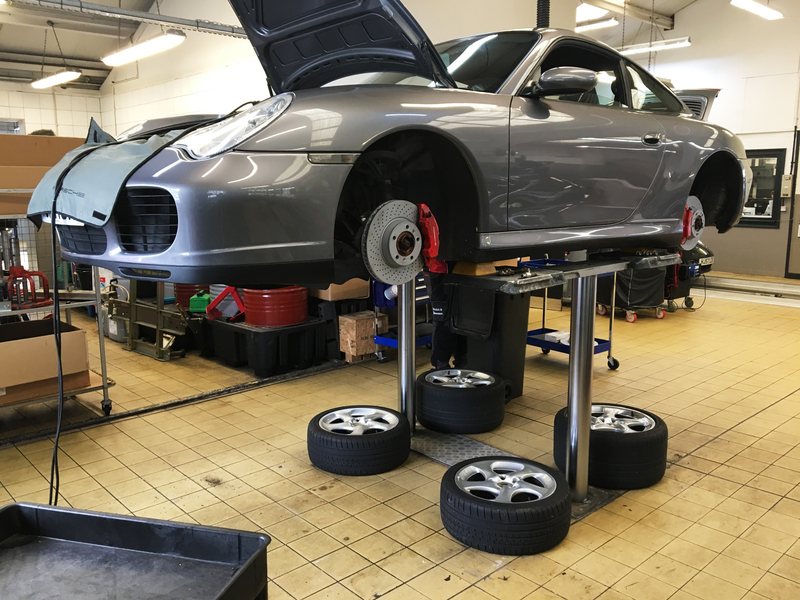 Thanks to the guys at Porsche Centre Bournemouth for stellar service as always – now, I can’t wait to wrack up some miles with my new toys courtesy of Heritage Parts and Michelin!